Guys. I know what movie I want to see next from Disney and Pixar. 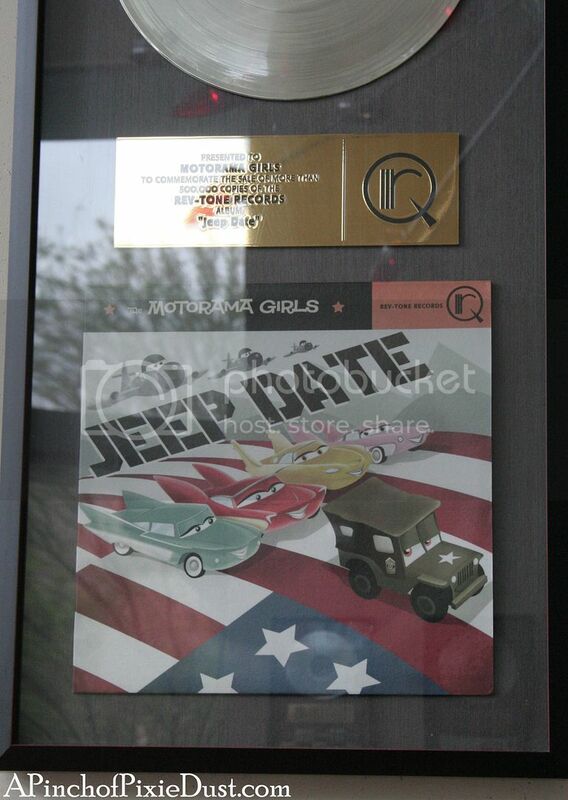 I want a movie about the MOTORMA GIRLS. 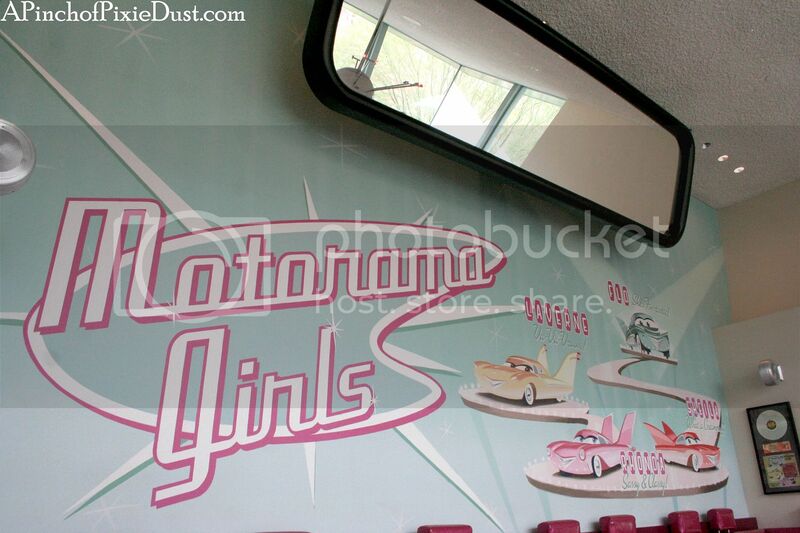 The Motorama Girls were a simply fabulous singing group...like the Supremes or the Chiffons...but made up of singing cars, of course. 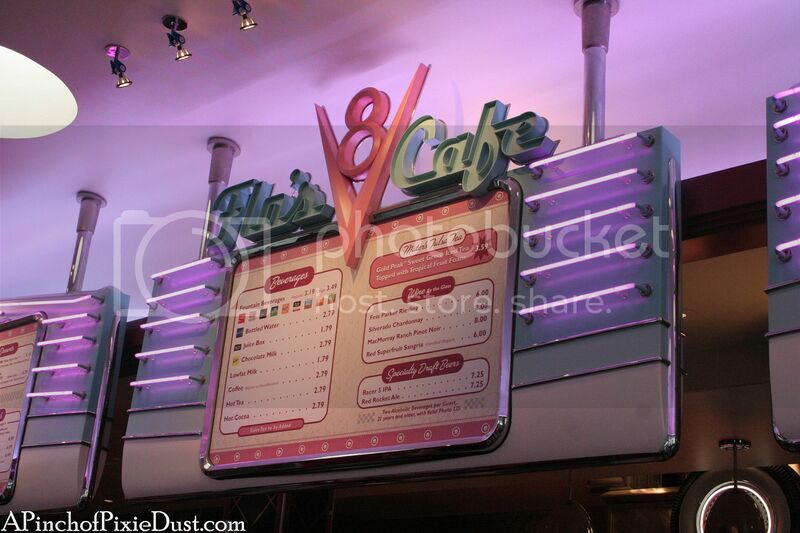 I first heard about them at Disneyland - at Flos' V8 Cafe at Disney's California Adventure! 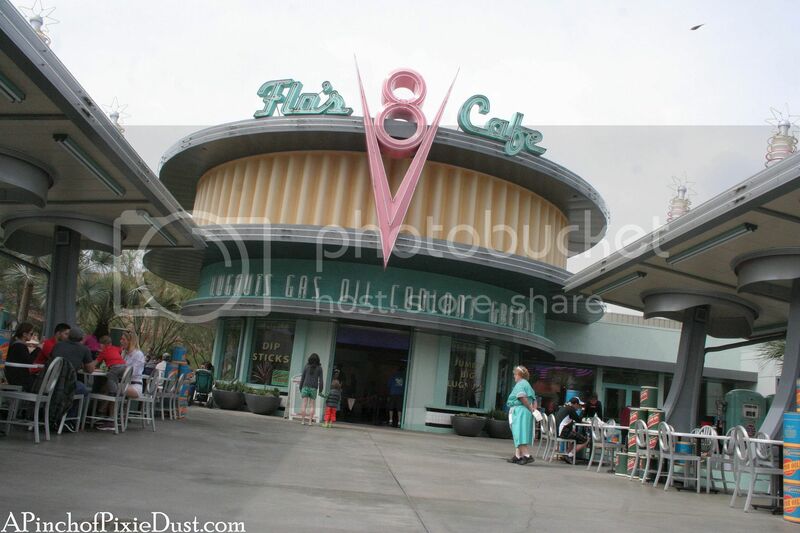 Flo herself was the star of the Motorama Girls act before she moved to Radiator Springs - so naturally her cafe has plenty of nods to her girl group. 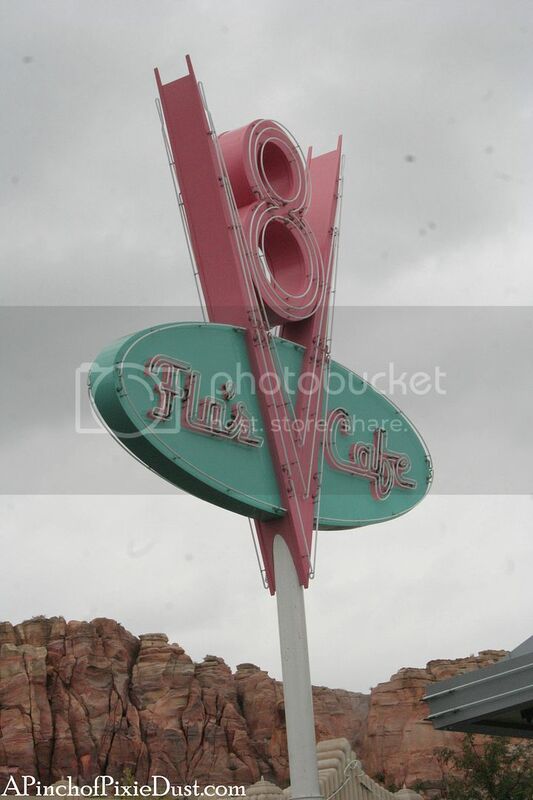 I completely fell in love with Flo's V8 Cafe. The retro design. The lights. 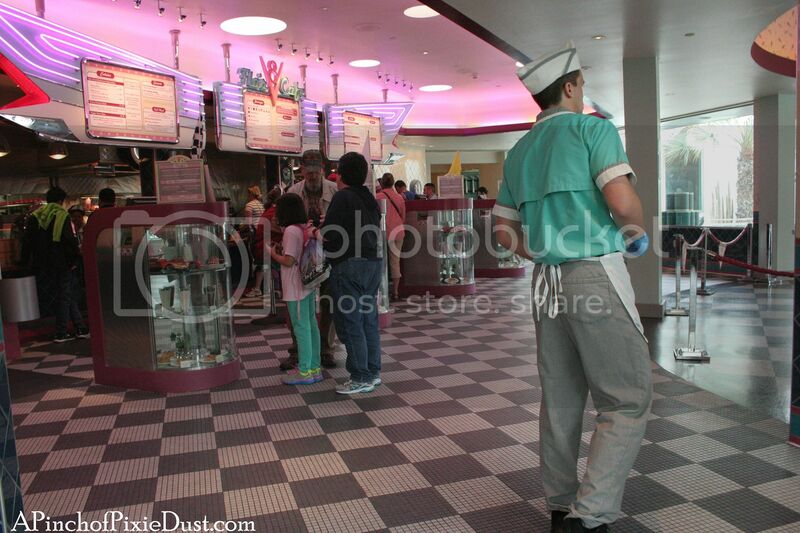 The car hop cast member costumes. THE MUSIC. 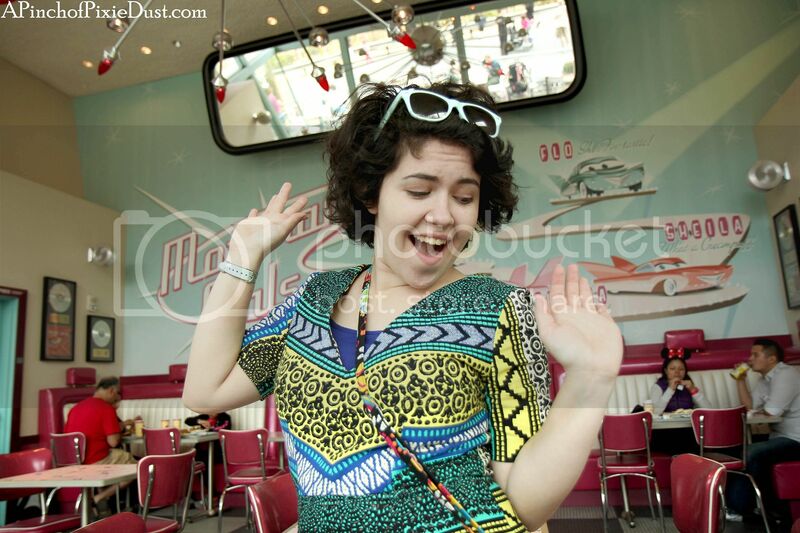 They had a fabulous 50's / 60's Motown playlist. 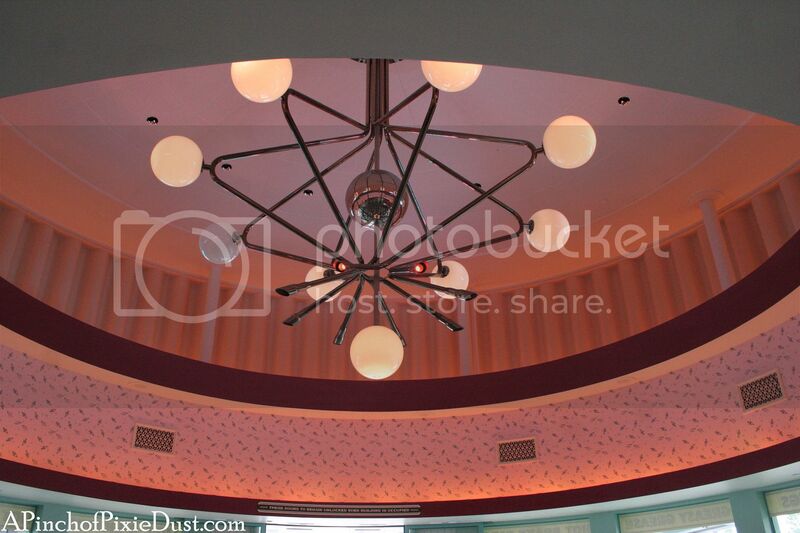 This chandy candy is right above you when you enter Flo's, and the lights in the atrium dance along to all the songs. 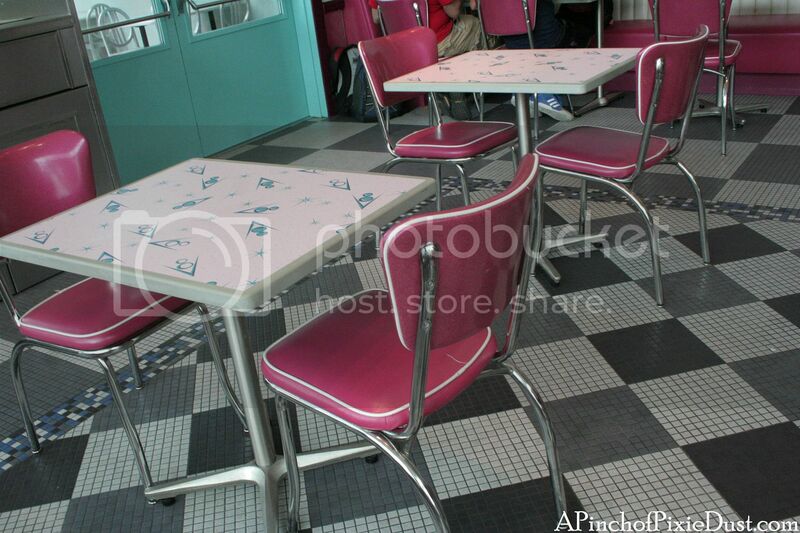 The real homage to the Motorama Girls can be found in one of the seating rooms at Flo's. THEY HAVE THEIR OWN MURAL. 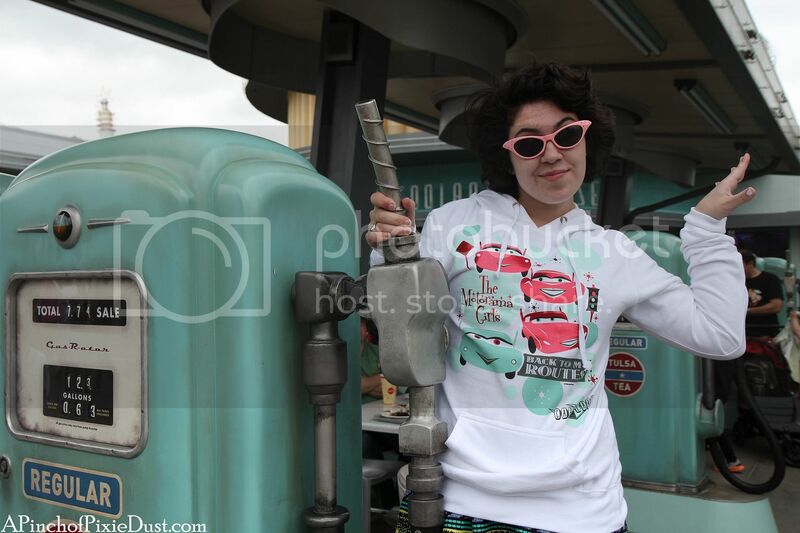 Flo: "She's Fin-tastic!" Laverne: "Va-Va-Vroom!" 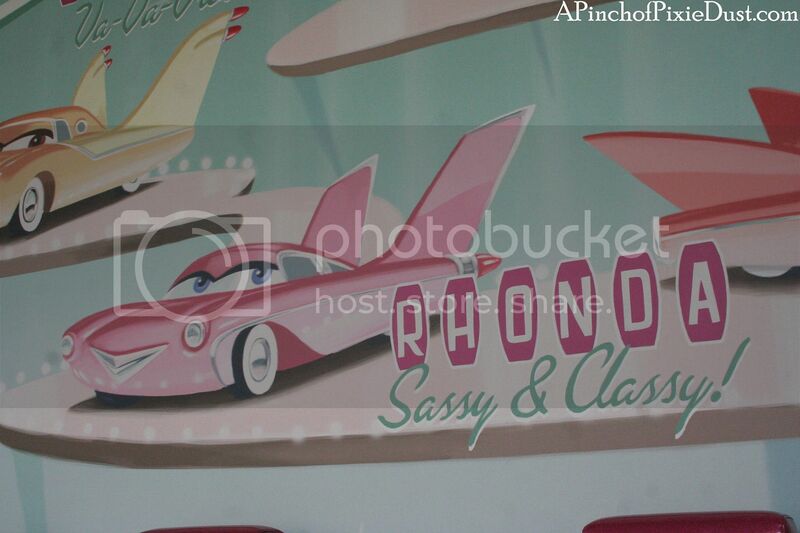 Rhonda is "Sassy & Classy!" I love it. Shelia might have my favorite slogan. "What a Creampuff!" 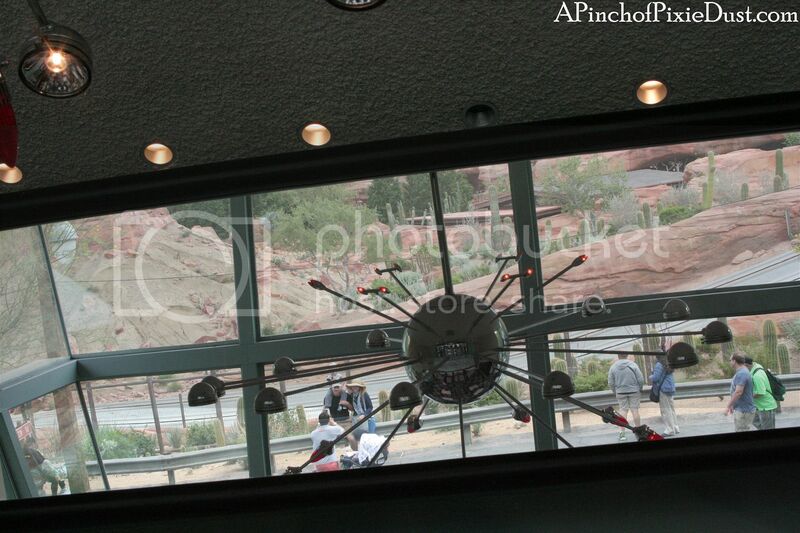 Above the mural is a giant rear-view mirror, which reflects yet another awesome chandelier and the vista of Ornament Valley beyond the giant windows. 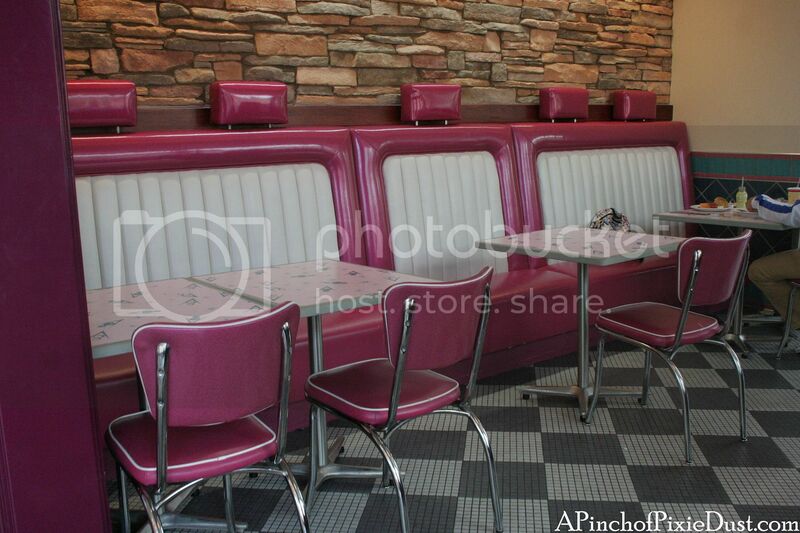 The checkered floors, the fabulous pink vinyl seating - this room is the perfect Motorama Girl hangout. 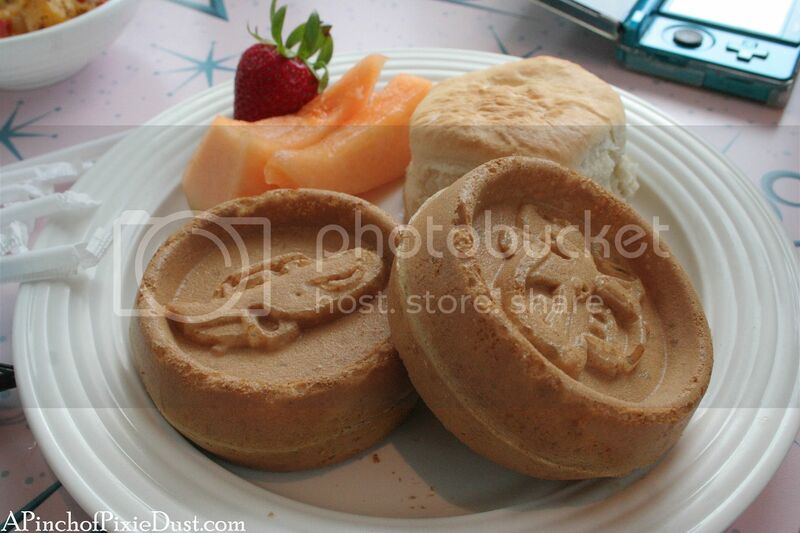 You know a Disney character is important when they're given their own waffle. 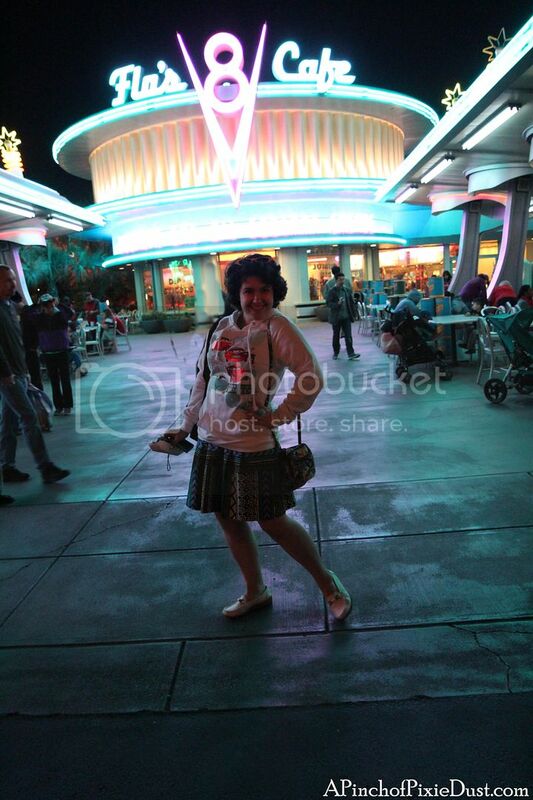 Flo is such a star. 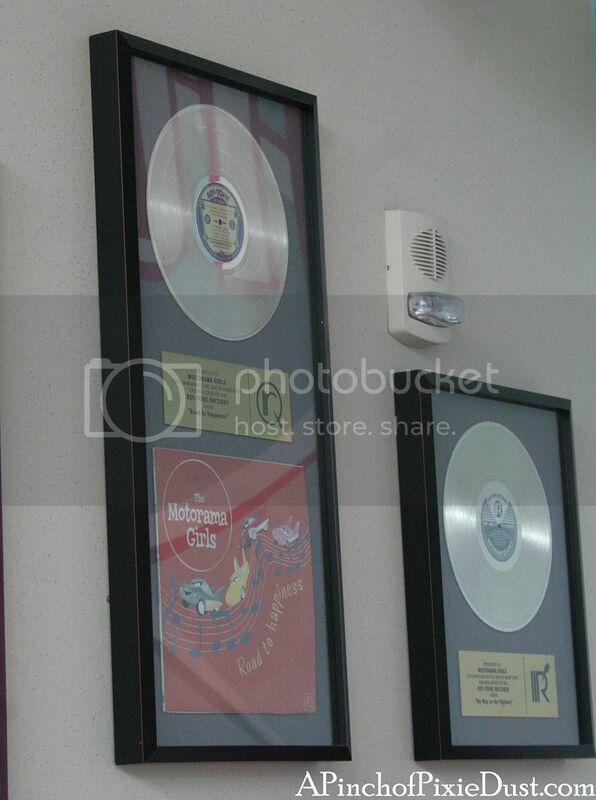 On the walls of the Motorama Girls room are all the Motorama Girls' hit records!! 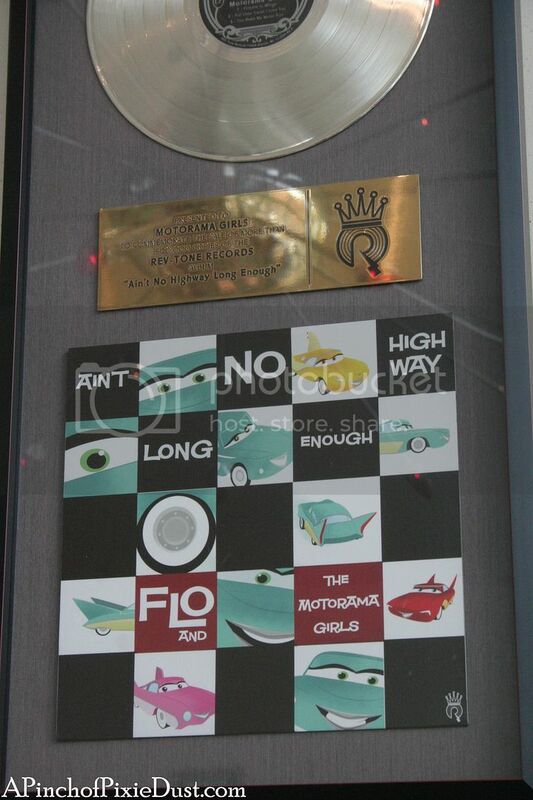 Like "Road to Happiness" and "My Way or the Highway." Also "Back to my Routes" and "Ain't No Highway Long Enough." 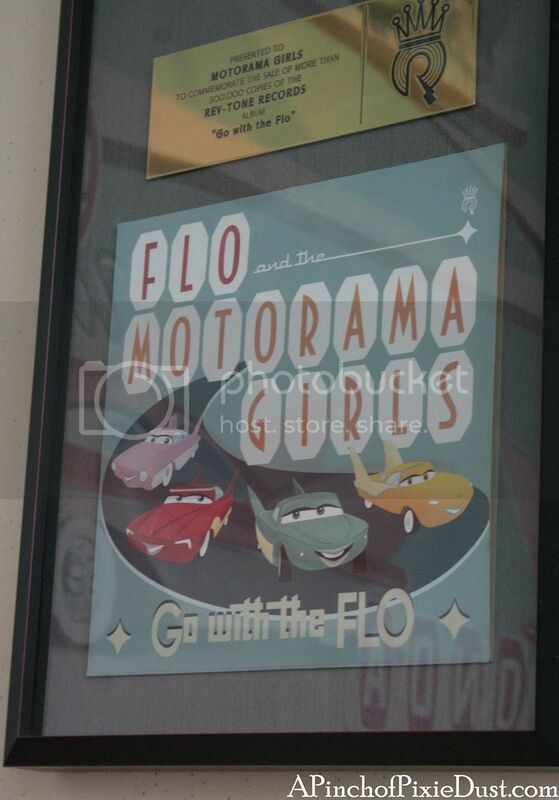 "Hubba Hubba Hubcaps" and "Jeep Date"
I need to listen to "Go with the FLO." Why doesn't it exist yet?? 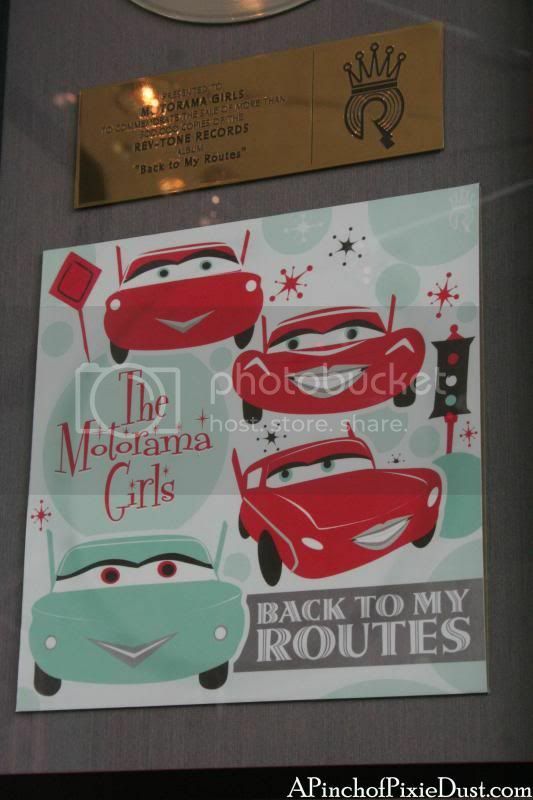 The Motorama Girls (apart from Flo) are sadly not actually in the Disney Pixar Cars movie. 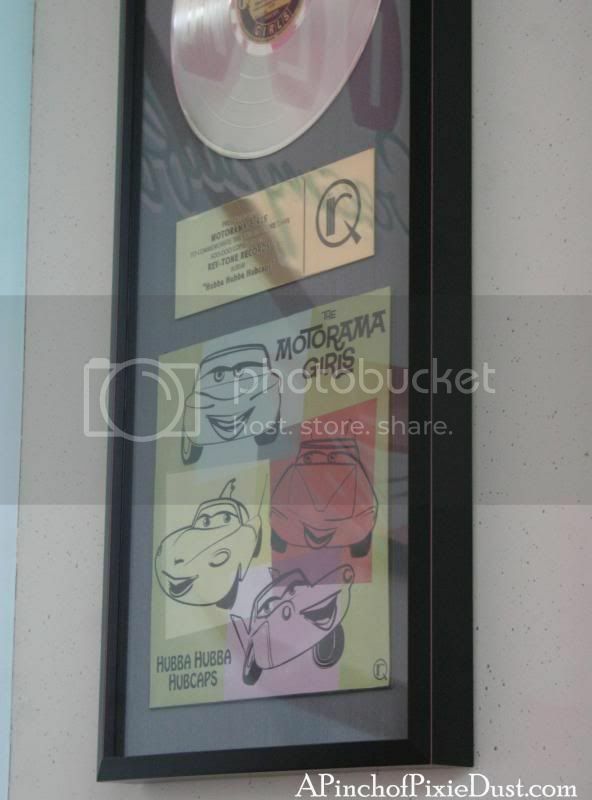 You'll only find them in one of the deleted scenes, in which Ramone tells Lightning McQueen his and Flo's backstory. 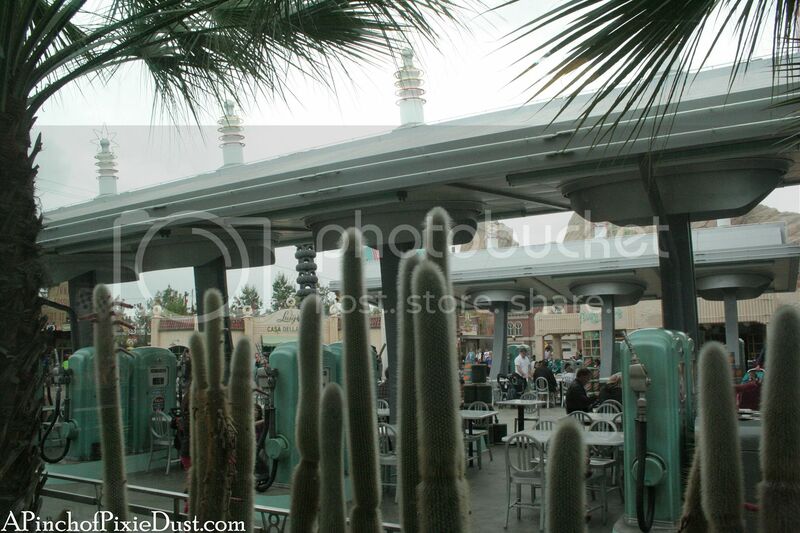 But I think it was absolute genius that the Imagineers took this lost storyline and gave it new life in Carsland. 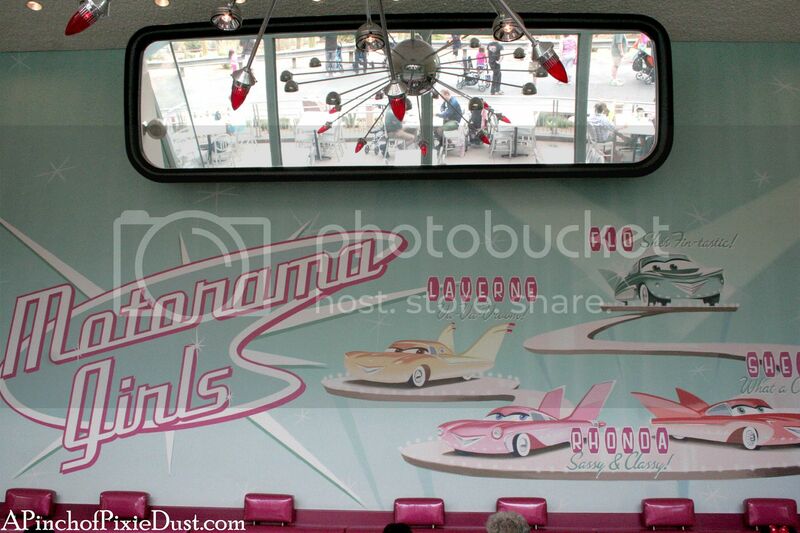 This is exactly what I love so much about Disney parks - not only do they recreate the worlds from your favorite movies - they also plus those worlds with new magic and even new characters like the Motorama Girls. 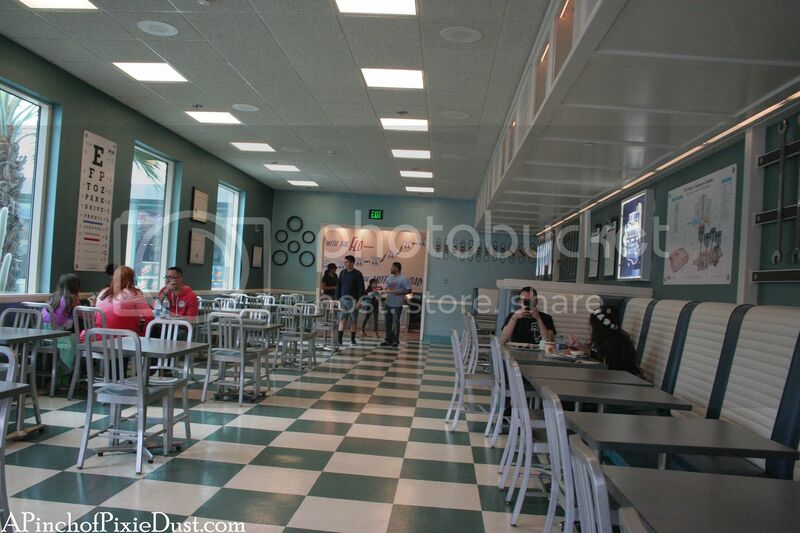 I've found some new additions to Disney World disappointing because they've lacked that extra pixie dust. Think of Belle's Village in New Fantasyland - yes, it's fun, and I like the castle and Gaston's Tavern. But I would've loved to see something more - maybe more of the other villagers. We could've had a Bimbette's Beauty Parlor. Instead we have an incongrous-looking portrait of a park executive. 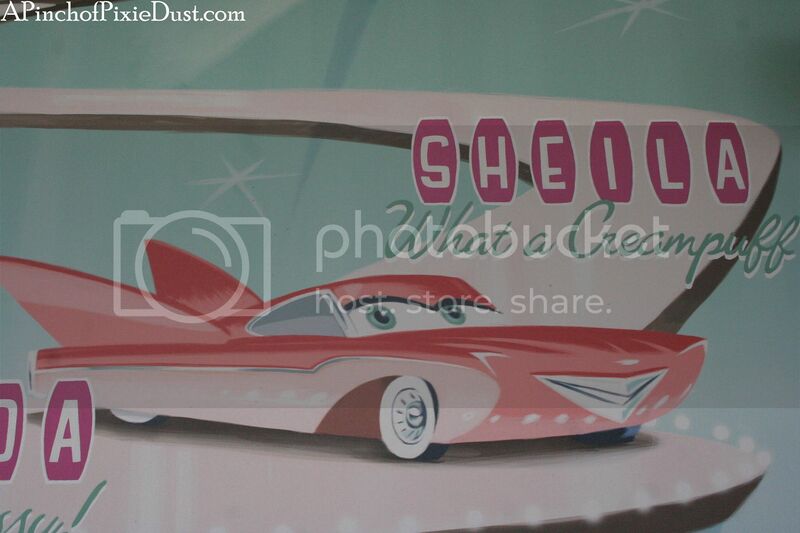 I love that Disney put some effort into theming for the minor as well as the major characters with Carsland. I am a diehard Motorama Girl fan now. They need their own movie. Can't you just imagine the soundtrack?? Motorama Girl all day and ALL NIGHT. 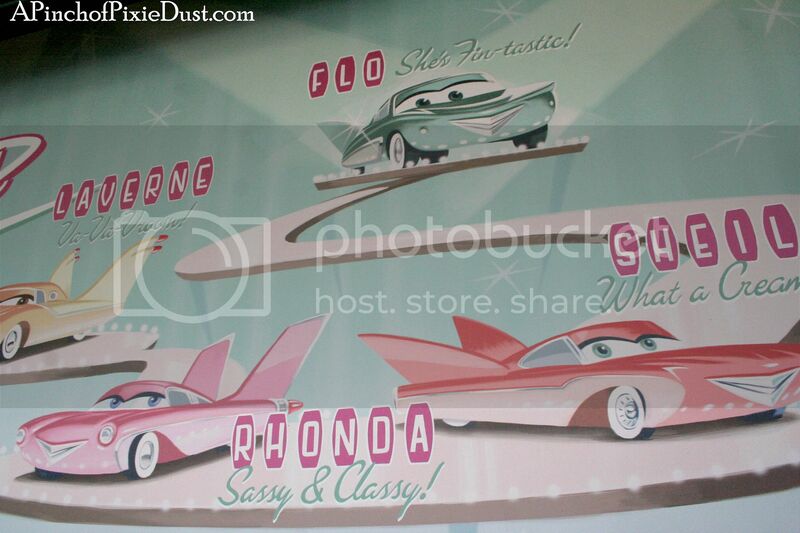 I'll have to do another post about Flo's soon, because the Motorama Girls are only half of the story - Doc Hudson has his own wing too! ...and we haven't even talked about the food! 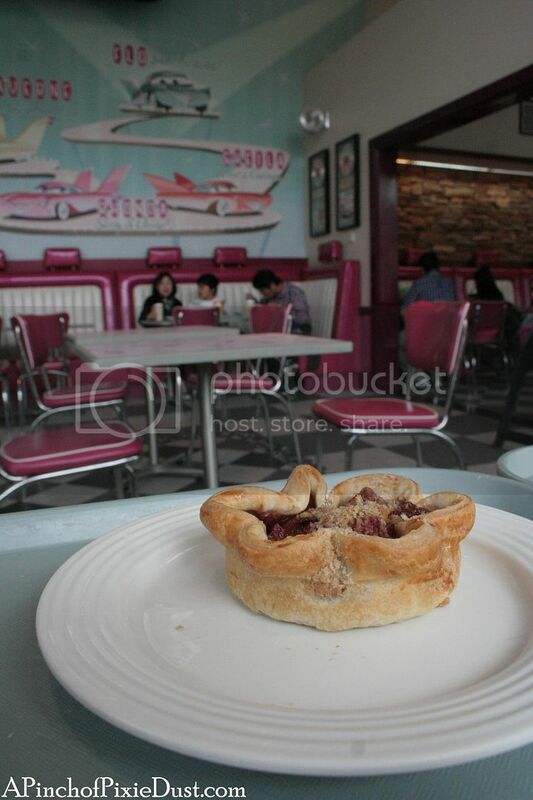 Like the PIE-O-RAMA. I'm saving that for a Sweet Treat Monday very soon. 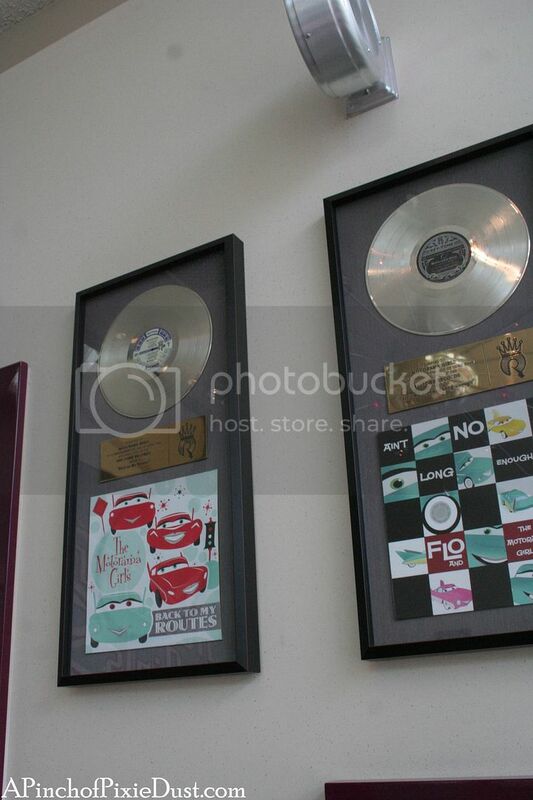 Totally Random Tidbit: I just came across the website of Mike Segawa, the artist who did some of the album cover art at Flo's - more fun Motrama Girls designs to look at! 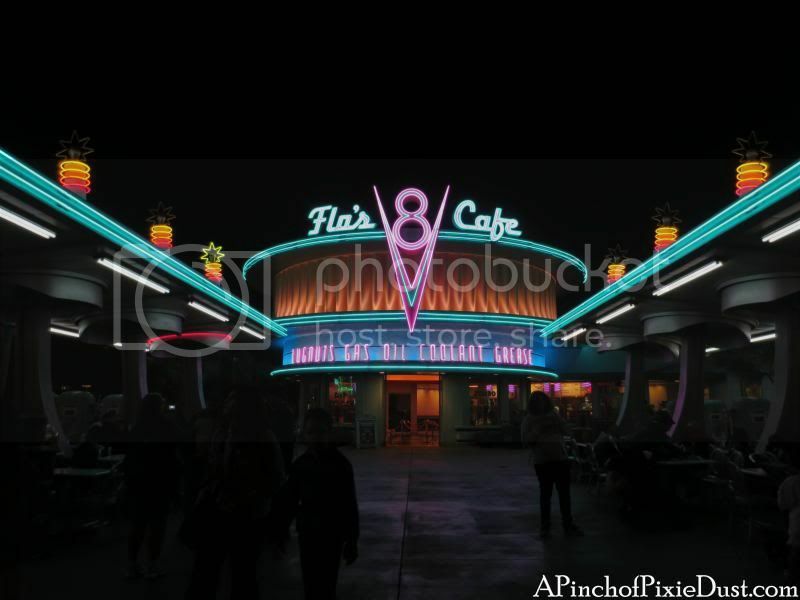 I will definitely be looking forward to Flo's when I ever make it out to Disneyland! What a fabulous post. Now I want to see that movie too - maybe Pixar will find your post and get an idea!